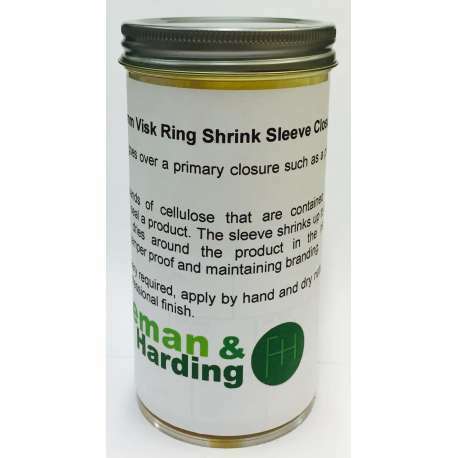 24mm x 32mm Visk Ring Shrink Sleeve Closure to suit 5oz and 10oz sauce bottles. A secondary seal that goes over a primary closure such as a plastic cap or stopper. Eco friendly tubular bands of cellulose that are contained in a preservative solution to seal a product. The sleeve shrinks up to 30% the original size and dries around the product in the natural environment, making it tamper proof and maintaining branding. Easy to use, no machinery required, apply by hand and dry naturally, results in the perfect professional finish.